With five individual toe pockets to permit natural, full movement, the unique design of ToeSox has been shown to increase circulation, flexibility and dexterity during any activity, helping strengthen the toe and foot muscles of your feet for better overall stability and balance. These ToeSox Full Toe Organic Cotton Ankle Yoga Socks are recommended for all yoga, Pilates, ballet and dance, martial arts, and barre work. 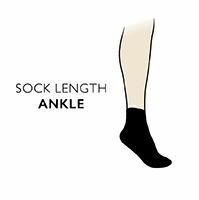 The socks have anti-slip grips on the sole for greater traction, with inbuilt arch support bands and secure fitted heels. ToeSox are 90% organic cotton rich stretch fabric, for a breathable, soft and accurate fit.